Book Yourself A Classic Ride. Did you know? 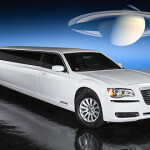 The stretch limousine was invented in 1928 in Fort Smith, Arkansas. Originally used to transport jazz band leaders, they were referred to in those early days as “big band buses”. 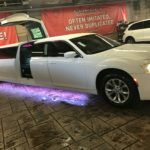 Since those times the stretch limo has always been an American icon and an enduring symbol of comfort, status and luxury – and Sunset Luxury Limousines has the best that money can buy. To ride around Denver in one of Sunset’s stretch limos is to enjoy the very apex of luxury, comfort and class. Select any of our modern, well appointed Chrysler 300C options below – or call (303) 426-9668 or click to reserve a limo today. One of our two brand new 2019 Chrysler 300Cs, this one in sleek black. The gullwing 5th door makes this the perfect wedding limousine. 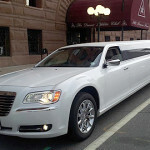 Rent a white Chrysler 300C limo in Denver only from Sunset Limos! Our white Chrysler 300c one of our newest fleet additions that updated our old fleet of Lincoln Town Cars. One of our two brand new 2019 Chrysler 300Cs, this one in wedding white. The gullwing 5th door makes this the perfect wedding limousine. 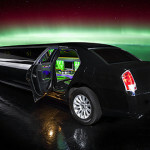 The largest stretch limo we have, for the largest parties.